About Us — Elisco's Creative Café | Advertising. Branding. Digital. Our branding agency serves fresh brand ideas and food at our café style setting. We believe food nourishes the soul and helps foster great thinking. 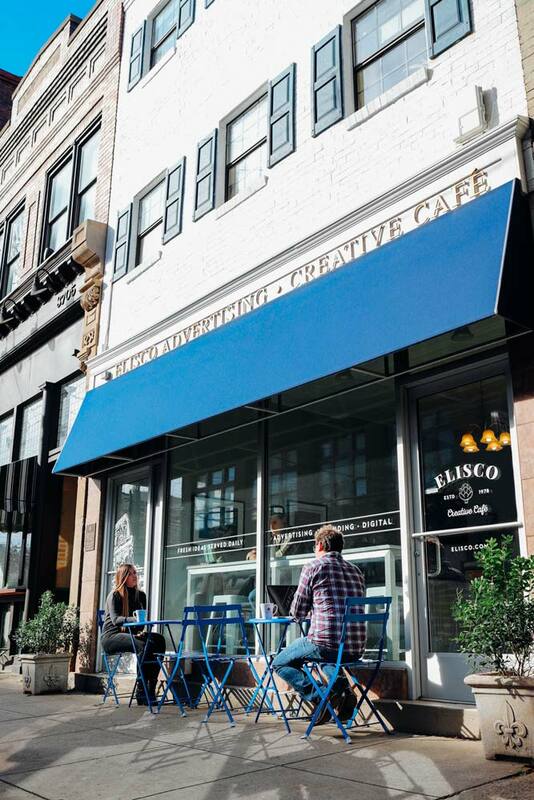 Comparing Elisco’s Creative Café to a traditional ad agency? It’s like apples and oranges. A new kind of venue — a unique kind of branding agency. We’ve combined our favorite elements from Campania, Bordeaux and Napa and put them into our storefront on Butler Street. It’s a new kind of venue and agency: a café-like setting where we serve fresh ideas daily and lunch periodically. Here, we conduct business and celebrate life in a warm, well-lighted place that’s conducive to creative thinking and growing fig trees. Our approach is relational, not transactional. While we’re proud of the number of branding projects we’ve completed in healthcare, food & beverage and financial services, we measure our results by the success of our clients, not the volume of our work. To us, that’s how lasting partnerships are built. After all, we believe that a café lifestyle — morning espresso with friends, bike rides to the market, leisurely meals and a glass of wine with loved ones — is not only good for the soul, it’s even better for business. Since we opened in 1978, a lot has changed including our name and logo.